The American Athletic Conference (AAC), also known as "the American", is an American collegiate athletic conference, featuring 12 member universities and six associate member universities that compete in the National Collegiate Athletic Association's (NCAA) Division I, with its football teams competing in the Football Bowl Subdivision (FBS). Member universities represent a range of private and public universities of various enrollment sizes located primarily in urban metropolitan areas in the Northeastern, Midwestern, and Southern regions of the United States. The league is the product of substantial turmoil in the old Big East during the 2010–14 conference realignment period. It is one of two conferences to emerge from the all-sports Big East in 2013. While the other successor, which does not sponsor football, purchased the Big East Conference name, The American inherited the old Big East's structure and is that conference's legal successor. However, both conferences claim 1979 as their founding date, and the same history up to 2013. The American is headquartered in Providence, Rhode Island, and led by Commissioner Michael Aresco. The Big East Conference was founded in 1979 as a basketball conference and included the colleges of Providence, St. John's, Georgetown, and Syracuse, which in turn invited Connecticut (UConn), Holy Cross, Rutgers, and Boston College to be members. UConn and Boston College would accept the invitation, while Holy Cross soon thereafter declined the invitation, and Rutgers eventually declined and remained in the Atlantic 10 Conference (then known as the Eastern 8 Conference). Seton Hall was then invited as a replacement, and the conference started play with seven members. Villanova and Pittsburgh joined shortly thereafter under the leadership of the Big East's first commissioner, Dave Gavitt. The conference remained largely unchanged until 1991, when it began to sponsor football, adding Miami as a full member, and Rutgers, Temple, Virginia Tech, and West Virginia as football-only members. Rutgers and West Virginia were offered full all-sports Big East membership in 1995, while Virginia Tech waited until 2000 for the same offer. Temple football was kicked out after the 2004 season, but rejoined in 2012 and intended to become a full Big East member in 2013. The unusual structure of the Big East, with the "football" and "non-football" schools, led to instability in the conference. The waves of defection and replacement brought about by the conference realignments of 2005 and the early 2010s revealed tension between the football-sponsoring and non-football schools that eventually led to the split of the conference in 2013. The conference was reorganized following the tumultuous period of realignment that hobbled the Big East between 2010 and 2013. The Big East was one of the most severely impacted conferences during the most recent conference realignment period. In all, 14 member schools announced their departure for other conferences, and 15 other schools announced plans to join the conference (eight as all-sports members, and four for football only). Three of the latter group later backed out of their plans to join (one for all sports, and the other two for football only). 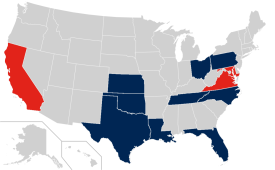 On December 15, 2012, the Big East's seven remaining non-FBS schools, all Catholic institutions consisting of DePaul, Georgetown, Marquette, Providence, St. John's, Seton Hall, and Villanova announced that they voted unanimously to leave the Big East Conference effective June 30, 2015. The "Catholic 7", by leaving, were looking for a more lucrative television deal than the one they would receive by remaining with the football schools. In March 2013, representatives of the Catholic 7 announced they would leave the conference effective June 30, 2013, retaining the Big East name, $10 million, and the right to hold the conference's basketball tournament at Madison Square Garden. Following the announcement of the departure of the Catholic 7 universities, the remaining ten football-playing members started the process of selecting a new name for the conference and choosing a new site to hold its basketball tournament. Various names were considered, with the "America 12" conference reportedly one of the finalists until rejected by college presidents sensitive of adding a number to the end of the conference name. On April 3, 2013, the conference announced that it had chosen a new name: American Athletic Conference. The conference also revealed that it prefers the nickname "The American" because it was thought "AAC" would cause too much confusion with the Atlantic Coast Conference (ACC). Louisville and Rutgers spent one season in the renamed conference. On July 1, 2014, Louisville joined the ACC and Rutgers joined the Big Ten Conference. On that same day, East Carolina, Tulane, and Tulsa joined The American for all sports, while Sacramento State and San Diego State joined as associate members for women's rowing. Navy joined as an associate member in football on July 1, 2015. For the next several years, The American did not discuss the addition of any new members. However, in March 2017, media reports indicated that the conference was seriously considering adding one or more new members specifically as basketball upgrades. Wichita State, Dayton, and VCU were reportedly considered, with Wichita State being seen as the strongest candidate. By the end of that month, it was reported that talks between the American and Wichita State had advanced to the point that the two sides were discussing a timeline for membership, with the possibility of the Shockers joining as a full but non-football member as early as the 2017–18 school year. The report indicated that a final decision would be made in April. The conference's board of directors voted unanimously on April 7 to add Wichita State effective in July 2017, making the Shockers the league's first full non-football member since the Big East split. The conference currently has 12 full member institutions – and six associate members – in 13 states, including California, Connecticut, Florida, Kansas, Louisiana, Maryland, North Carolina, Ohio, Oklahoma, Pennsylvania, Tennessee, Texas, and Virginia. The newest full member, Wichita State, is the only one that does not sponsor football. Two full members have departed from the conference. One associate member has left the conference. The American currently sponsors championship competition in 10 men's and 12 women's NCAA sanctioned sports. Old Dominion, Sacramento State and San Diego State are associate members for women's rowing. The newest conference sport of women's lacrosse, added for the 2018–19 school year, has six participating schools, with four full American members plus Florida and Vanderbilt as single-sport associates. Women's Bowling – The Southland Conference provides administrative support for the Southland Bowling League, but the SBL operates independently from regular conference operations. The women's bowling league was established in 2015 and includes Southland Conference members Sam Houston State and Stephen F. Austin, plus Arkansas State, Louisiana Tech, Tulane, Valparaiso, Vanderbilt, and Youngstown State. Excluded from this list are all national championships earned outside the scope of NCAA competition, including Division I FBS football titles, women's AIAW championships, equestrian titles, and retroactive Helms Athletic Foundation titles. The conference began football during the 1991–92 season, and was a founding member of the Bowl Championship Series. Previously conference opponents operated on a two-year cycle, as a home-and-home series. The conference previously did not have enough teams to form divisions, but now does after Navy joined the conference in 2015. [note 12] When Navy joined in 2015 and divisions were created, Navy was placed in the West division along with Houston, Memphis, SMU, Tulane, and Tulsa. Teams play eight conference games a season. Since 2015, each team has played the other five teams in its own division, as well as three teams from the other division, operating in a four-year cycle ensuring that each school will play every conference opponent at home and on the road at least once in the four-year cycle. The East and West division winners, determined by final conference record, meet in the American Athletic Conference Football Championship Game, which is played at the home site of one of the division winners. Like the conference itself, football experienced much transition through its history – in fact it was the main force behind such departures and expansion. In 2003, the BCS announced that it would adjust the automatic bids granted to its six founding conferences based on results from 2004 to 2007. With the addition of Cincinnati, Louisville, and South Florida in 2005, the conference retained its BCS automatic-qualifying status. In 2007, South Florida rose to No. 2 in the BCS rankings, but finished No. 21 in the final poll. Cincinnati finished the 2009 regular season undefeated at 12–0, and ranked No. 3 in the final BCS standings, barely missing the opportunity to play for the BCS National Championship. The conference was 9–7 (.563) in BCS bowl games, the third highest winning percentage amongst the AQ conferences. After the 2017 Season, the University of Central Florida Knights, a member of the American, went undefeated but was not invited to the College Football Playoff. They earned the Group of Five's New Years Six bowl bid and defeated Auburn in the Peach Bowl. They would claim a national championship, which was recognized by the Colley Matrix, one of the NCAA recognized selectors of the national champion in football. As of Nov. 17, 2018. Conference wins and loses are from before and after the American Athletic Conference was formed. The American Championship Game pits the Eastern Division representative against the Western Division representative in a game held following the conclusion of the regular season. The site of the Championship Game is the home stadium of the division champion with the best overall conference record. In the event that the two division champions are tied, then the head-to-head record shall be used as the tiebreaker. Prior to the 2015 season, when the conference split into two six-team divisions and created a conference championship game, The American awarded its championship to the team(s) with the best overall conference record. The American has many rivalries among its member schools, primarily in football. Some rivalries existed before the conference was established or began play in football. Recent conference realignment in 2005 and 2013 ended – or temporarily halted – many rivalries. Before their departure to other conferences, a number of former member schools held longtime rivalries within the conference. Following the 2013 season, the BCS era came to a close and was replaced by the College Football Playoff. Four teams will play in two semifinal games, with the winners advancing to the new College Football Championship Game. Six bowl games — the Rose Bowl, Sugar Bowl, Orange Bowl, Cotton Bowl, Fiesta Bowl, and Peach Bowl — will rotate as hosts for the semifinal games, and host major bowls when they do not host semifinal games (access bowls). With the birth of the College Football Playoff, The American lost its automatic qualifying status for one of the major bowls. Instead, one automatic qualifying spot is reserved for the highest ranked team from the "Group of Five" conferences – The American, Conference USA, the Mid-American Conference, Mountain West Conference, and Sun Belt Conference. Although the pick order usually corresponds to the conference standings, the bowls are not required to make their choices strictly according to the won-lost records; many factors influence bowl selections, especially the likely turnout of the team's fans. Picks are made after any applicable College Football Playoff selections. If a team is selected for the one of the access bowls or playoff, the bowl with the No. 2 pick will have the first pick of the remaining teams in the conference. ^ From 2014 through 2016, this bowl was the Miami Beach Bowl played in Miami, Florida. ^ This group formerly included the Poinsettia Bowl, held in San Diego, but that game was discontinued after the 2016 season. The total pay of head coaches includes university and non-university compensation. This includes base salary, income from contracts, foundation supplements, bonuses and media and radio pay. Coaches and media of The American award individual honors at the end of each football season. In June 2013, it was announced that the inaugural men's basketball tournament would take place at FedExForum in Memphis. FedExForum had previously hosted eight Conference USA basketball tournaments. Even though the Big East Conference was meant to be a basketball-oriented conference, UConn, a member of The American, won the 2014 NCAA Division I Men's Basketball Tournament (the first after the conferences split). This list goes through the 2016–17 season. ^ Connecticut, after being eliminated from the conference tournament, went on to become the national champions after beating Kentucky 60–54 in the title game. ^ After Louisville basketball staffer Andre McGee was found to have paid a local madam to provide strippers and prostitutes to players and recruits from 2010 through 2014, the NCAA ordered all Louisville records from the 2010–11 through 2013–14 seasons to be vacated. In June 2013, it was announced that the inaugural women's basketball tournament would take place at the Mohegan Sun in Connecticut. Women's basketball teams have played a total of 20 times in the NCAA Women's Division I Basketball Championship (since 1982), with UConn winning 11 national championships under head coach Geno Auriemma since 1995. Women's national championship tournaments prior to 1982 were run by the AIAW. ^ Record since the 1972–73 season, considered by Memphis to be the start of its "modern era" of women's basketball. ^ Record since the 1976–77 season, considered by Wichita State to be the start of its "modern era" of Division I women's basketball. ^ Due to delays in the renovation of Hofheinz Pavilion, to be renamed Fertitta Center upon its reopening in December 2018, the men's and women's basketball teams will start their 2018–19 seasons at the Health and Physical Education Arena at Texas Southern University (capacity 8,100), where they played home games in 2017–18. ^ Temple splits its women's basketball schedule between McGonigle Hall and the Liacouras Center. ^ Wichita State discontinued its football program following the 1986 season. The Shockers' football facility, Cessna Stadium (capacity 30,000) still stands. It is the home of the Shockers' track and field program and hosts football games for Wichita's Kapaun Mt. Carmel High School. One of the current full member schools, Tulane University, is a member of the Association of American Universities (AAU), an organization of 62 leading research universities in the United States and Canada. Seven members are doctorate-granting universities with "very high research activity," the highest classification given by the Carnegie Foundation for the Advancement of Teaching. Member schools are also highly ranked nationally and globally by various groups, including U.S. News & World Report, Washington Monthly, and Times Higher Education. As of 2014[update], The American has carriage agreements with the following broadcast and cable networks. ABC broadcasts select football games. CBS broadcasts up to 12 appearances for men's and women's basketball games. CBS, under a separate contract with Navy that predated its association with The American for football, also carries select Navy neutral site football games, including all games against the U.S. Military Academy and select games against Notre Dame and Air Force. CBS Sports Network broadcasts football, men's and women's basketball, and baseball. ESPN broadcasts football, men's and women's basketball, across its networks (ESPN, ESPN2, ESPN3, ESPNews, and ESPNU). ESPN broadcasts the men's and women's basketball tournament, and the football championship game. Fox Sports Ohio broadcasts select men's basketball and football games for the University of Cincinnati. SportsNet New York broadcasts select men's basketball, women's basketball, and football games for the University of Connecticut. Cox Kansas broadcasts select basketball, baseball and volleyball games for Wichita State University. Spectrum Sports broadcasts select basketball games for SMU. American Digital Network broadcasts women's basketball games, most conference events otherwise not televised, baseball championship game, championship games for select olympic sports. The American Digital Network streams online on the American Athletic Conference website. Wikimedia Commons has media related to American Athletic Conference. ^ The American is the legal all-sports successor to the Big East Conference (1979–2013). The Big East was rebranded and reorganized as the American Athletic Conference on July 1, 2013. ^ The American is the legal successor to the Big East Conference (1979–2013) and retains its charter. The current Big East Conference purchased the "Big East" name during the 2013 conference breakup. ^ The other conferences in the "Group of Five" are Conference USA (C-USA), the Mid-American Conference (MAC), the Mountain West Conference, and the Sun Belt Conference. ^ Connecticut's football program did not join the conference until 2004. ^ Temple was not a Big East football member between the 2005 and 2011 seasons, most of this time being spent in the Mid-American Conference. Temple joined as a football only member in 2012, and as an all-sports member in 2013. ^ Rutgers joined the conference in 1991 as a football-only member, and joined in all-sports in 1995. ^ Under NCAA Bylaw 20.9.4, all Division I schools are required to sponsor a minimum of seven men's and seven women's sports, or six men's and eight women's sports. Bylaw 20.9.7.1 imposes the latter requirement on FBS schools. FCS schools, under Bylaw 20.9.8.1, may use either requirement. Note that this does not explicitly require that a school sponsor two more women's sports than men's sports. See "2012–13 NCAA Division I Manual" (PDF). NCAA. Retrieved March 7, 2013. ^ Navy continues to field most of its other sports in the NCAA Division I Patriot League. ^ a b Rifle is technically a men's sport, but men's, women's, and coed teams all compete against each other. ^ The only category of rowing that the NCAA governs is women's heavyweight rowing. All men's rowing is governed by the Intercollegiate Rowing Association. ^ At the time Navy joined in football, the NCAA required 12 teams for a conference to conduct divisional play and stage a championship game that was exempt from the NCAA-imposed limit of 12 regular-season games. Starting with the 2016 season, a conference can conduct an "exempt" championship game with fewer than 12 members, as long as it either plays in two divisions or conducts a full round-robin schedule. ^ If The American's champion is the highest ranked from among the "Group of Five" conferences, it will receive a bid to either the Cotton Bowl, the Peach Bowl, or the Fiesta Bowl. If the team is ranked in the top four at the end of the regular season, it will take part in the College Football Playoff. ^ a b "New Name in College Sports – Current BIG EAST Enters New Era as 'American Athletic Conference'". April 3, 2013. Archived from the original on April 21, 2013. Retrieved April 3, 2013. ^ a b Katz, Andy (March 15, 2013). "What's next for the 'old Big East'". ESPN. Retrieved March 17, 2013. ^ a b McMurphy, Brett (March 1, 2013). "Catholic 7 to keep 'Big East' name for new league next season, according to sources". ESPN. Retrieved March 7, 2013. ^ Mandel, Stewart (November 12, 2012). "Big East, rest of 'Group of Five' score win with six-bowl decision". Sports Illustrated. Retrieved March 8, 2013. ^ "The American Athletic Conference - About the American Athletic Conference". February 9, 2014. Archived from the original on February 9, 2014. Retrieved July 15, 2018. ^ "Big East Conference - BIG EAST Conference History". www.bigeast.com. Retrieved July 15, 2018. ^ a b Russo, Ralph (March 8, 2013). "Big East completes official split of football, basketball". Associated Press. Archived from the original on April 10, 2013. Retrieved March 17, 2013. ^ Blaudschun, Mark (March 8, 2013). "Naming original Big East was simple". AJerseyGuy.com. Archived from the original on April 8, 2014. Retrieved March 9, 2013. ^ a b Crouthamel, Jake (December 8, 2000). "A Big East History and Retrospective, Part 1". SUAthletics.com. Retrieved March 9, 2013. ^ Sarah Maslin Nir (September 17, 2011). "Dave Gavitt, the Big East's Founder, Dies at 73". The New York Times. Retrieved March 9, 2013. ^ "Big East, Villanova Make It Official". The Pittsburgh Press. United Press International. March 13, 1980. Retrieved March 9, 2013. ^ Hanley, Richard F (November 19, 1981). "Pittsburgh To Join Big East". Record-Journal. Retrieved March 9, 2013. ^ "Big East Football Timeline". Philadelphia Inquirer. March 8, 2008. Archived from the original on August 27, 2012. Retrieved March 9, 2013. ^ Thamel, Pete (May 7, 2012). "Commissioner John Marinatto Steps Down Amid Big East's Instability". The New York Times. Retrieved March 9, 2013. ^ "Big East 'unwilling' to meet terms". ESPN. January 3, 2013. Retrieved March 9, 2013. ^ Katz, Andy; McMurphy, Brett (December 11, 2012). "Big East fate vexes Catholic schools". ESPN. Retrieved December 11, 2012. ^ "Seven schools leaving Big East". ESPN. December 15, 2012. Retrieved December 15, 2012. ^ Rovell, Darren (January 6, 2013). "Sources: 'Catholic 7' eyes big TV deal". ESPN. Retrieved March 6, 2013. ^ Harten, David (March 5, 2013). "Catholic 7 has framework to keep Big East name, MSG as tourney site". NBC Sports. Retrieved March 7, 2013. ^ Blaudschun, Mark (March 6, 2013). "Big East, Catholic 7 ready to make split official". AJerseyGuy.com. Archived from the original on December 3, 2013. Retrieved March 7, 2013. ^ "Report: $100M for football schools". ESPN. March 5, 2013. Retrieved March 7, 2013. ^ Former Big East to be named American Athletic Conference. ESPN (April 4, 2013). Retrieved on 2013-07-15. ^ Wolken, Dan (May 29, 2013). "American Athletic Conference unveils its primary logos". USA Today. Beyond the challenge of avoiding something that looked corporate, the league also couldn't build the logo around an acronym. From the very beginning, the conference office has been adamant that it wants to be known as The American instead of the AAC to avoid confusion with the Atlantic Coast Conference. ^ Rutgers Scarlet Knights accept invitation to join Big Ten as Board of Governors gives go-ahead to athletic director Tim Pernetti. NY Daily News (November 19, 2012). Retrieved on 2013-07-15. ^ a b "At a glance: Latest wave of conference realignment". USA Today. June 29, 2014. Retrieved June 30, 2014. ^ "The American adds Associate Members for Women's Rowing" (Press release). American Athletic Conference. March 25, 2014. Retrieved May 17, 2014. ^ Dodd, Dennis (March 3, 2017). "Wichita State getting 'serious evaluation' to join American Athletic Conference". CBSSports.com. Retrieved March 6, 2017. ^ Thamel, Pete (March 31, 2017). "Sources: Wichita State in talks to join AAC as soon as 2017–18". Sports Illustrated. Retrieved March 31, 2017. ^ "Source: Wichita St. eyes 2017 move to AAC". ESPN.com. Retrieved April 4, 2017. ^ "AAC Is Preparing For Wichita State To Join League In 2017–18". www.fanragsports.com. Retrieved April 4, 2017. ^ "Wichita State to Become Member of American Athletic Conference" (Press release). American Athletic Conference. April 7, 2017. Retrieved April 7, 2017. ^ "UCF Facts 2017-2018 - University of Central Florida - Orlando, FL". Retrieved July 15, 2018. ^ "UC Facts". University of Cincinnati. Retrieved July 15, 2018. ^ "Record Enrollment". www.ecu.edu. Retrieved July 15, 2018. ^ "UofM Facts at a Glance - About UofM - The University of Memphis". www.memphis.edu. Retrieved July 15, 2018. ^ "StudentEnrollment2017 - SMU". www.smu.edu. Retrieved July 15, 2018. ^ "Facts and Figures - Tulane University". tulane.edu. Retrieved July 15, 2018. ^ "TU Fast Facts - The University of Tulsa". Retrieved July 15, 2018. ^ The Official Site of The American Athletic Conference – Sponsored Sports. American Athletic Conference. Retrieved on June 10, 2014. ^ "New Southland Bowling League Established". Southland Conference. January 20, 2014. Retrieved January 24, 2014. ^ "BCS Chronology". bcsfootball.org. Fox Sports. Archived from the original on April 18, 2008. Retrieved November 12, 2008. ^ Myerberg, Paul (November 13, 2012). "Big East announces divisions, adds conference title game". USA Today. Retrieved December 10, 2012. ^ "American Announces Football Schedule Format for 2015–18". USA Today. December 18, 2012. Retrieved December 18, 2014. ^ Wolken, Dan (April 25, 2013). "Questions and answers for the College Football Playoff". USA Today. Retrieved April 25, 2013. ^ "American Bowl Lineup 2014–19". sidearm sports. Retrieved October 19, 2014. ^ a b "Salaries & Contracts". Coaches Hot Seat. Retrieved September 19, 2016. ^ "USA TODAY Sports". USA TODAY Sports. Retrieved July 15, 2018. ^ American Athletic Conference (December 11, 2013). "American Athletic Conference Announces 2013 Postseason Football Honors". Retrieved December 31, 2013. ^ "American Athletic Conference picks Memphis to host league's 1st men's basketball tournament". Washington Post. Archived from the original on June 13, 2013. ^ Schlabach, Mark (February 20, 2017). "NCAA denies Louisville's appeal, rules Cardinals must vacate 2013 national title". ESPN.com. Retrieved February 20, 2017. ^ "AAC tournament host site picked". ESPN. Retrieved June 30, 2014. ^ "NCAA Division I Women's Basketball Records Through 2012–13" (PDF). NCAA. Retrieved March 18, 2014. ^ Duarte, Joseph (March 4, 2018). "UH will begin next season at H&PE Arena while Fertitta Center is being finished". Houston Chronicle. Retrieved May 8, 2018. ^ "AAU Member Institutions and Years of Admission". Association of American Universities. Retrieved June 6, 2014. ^ a b "Carnegie Classifications Institution Lookup". Carnegie Foundation for the Advancement of Teaching. 2014. Retrieved April 30, 2015. ^ "National Association of College and University Business Officers" (PDF). National Association of College and University Business. 2014. Archived from the original (PDF) on February 23, 2017. Retrieved April 30, 2015. ^ "Best College Rankings and Lists". U.S. News & World Report. 2016. Archived from the original on May 21, 2011. Retrieved July 15, 2018. ^ "Washington Monthly College Guide 2016 National Universities". Washington Monthly. 2016. Retrieved June 30, 2017. ^ "University Ranking by Academic Performance – United States of America 2016–2017". Informatics Institute, Middle East Technical University. 2017. Retrieved June 30, 2017. ^ "American Athletic Conference on TV". American Athletic Conference. Retrieved June 30, 2014. ^ "CBS Sports Network Lands Rights to American Athletic Conference". CBS Sports. August 21, 2013. Retrieved June 30, 2014. ^ "American Athletic Conference Announces American Digital Network". American Athletic Conference. Retrieved June 30, 2014.